There’s a strong case that the housing market is set up for a another boom. Wages are rising, millennials are old enough to start buying their first homes, and demand is at record levels. Unfortunately, Bank of America Merrill Lynch’s Michelle Meyer has a few “unconventional” numbers that may douse the take-off hopes. Meyer, an economist at BAML, started by pointing out that more conventional housing data such as existing home sales and housing starts can be incredibly noisy. Thus, finding alternative measures can be a valuable method of observing trends. “It is therefore useful to look at a wide range of indicators to assess the true health of the housing market,” wrote Meyer in a note to clients on Monday. The first measure, jobs for real estate agents and brokers, has looked disappointing in recent months, according Meyer. The number of realtor jobs has fallen 3,300 since the start of the year which confirms the idea of a “choppy” market for home sales: Meyer reasons that this decrease could reflect lessening demand for real estate. 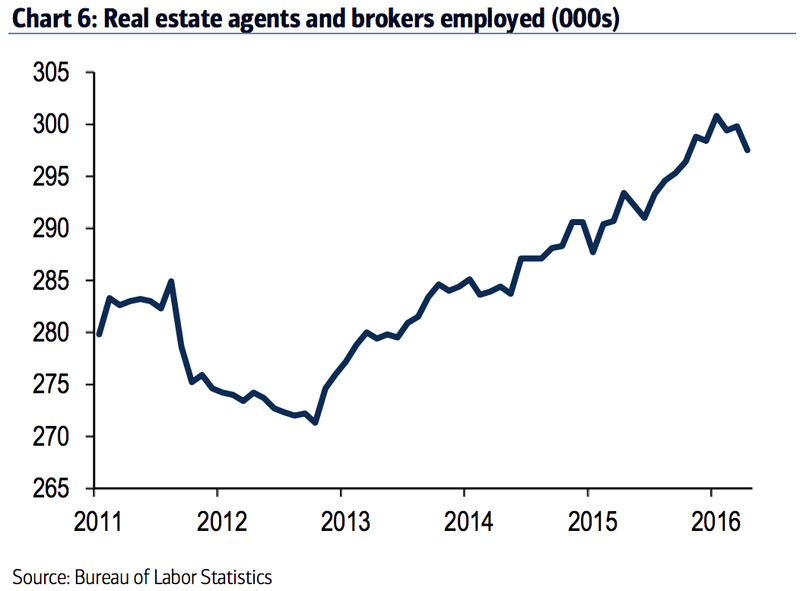 However, job creation in this sector is a lagging indicator, while new home sales and purchase applications are leading, which suggests we might see job growth pick up for real estate agents and brokers in coming months. 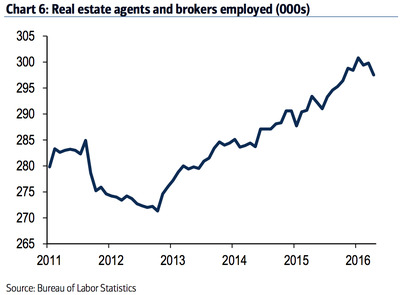 Moreover, the overall recovery in jobs for real estate agents and brokers since the trough has been lacklustre relative to the gain in sales, suggesting that there have been efficiency gains in the industry. While the recent weakness in the labour market for Realtors is sending a red flag, it is not a clear turn for the worse. Basically the loss of jobs is certainly not good, but it may not be a signal of total disaster. 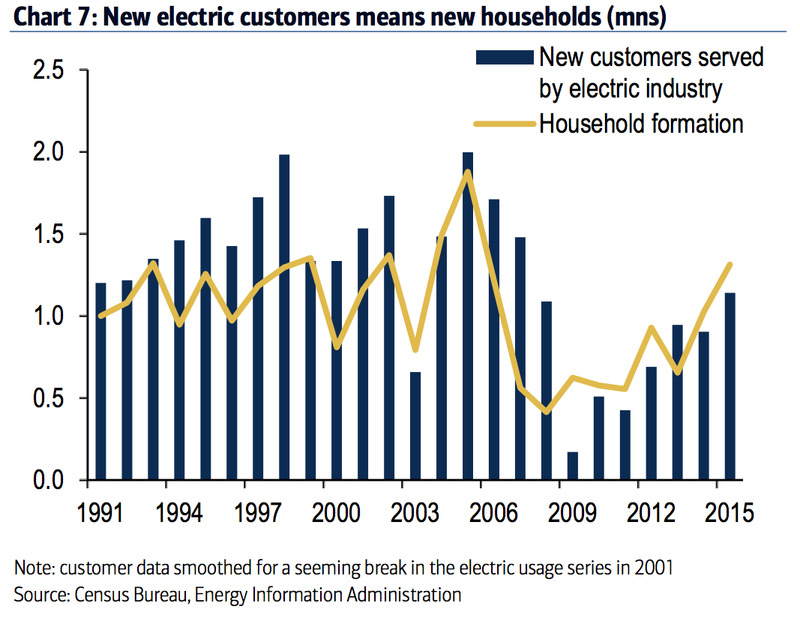 On the other side, Meyer said that the number of new electric utility customers has picked up, which could mean that there are new households forming and signing up for services to power their new homes. The recent trend in this measure, however, signals the pick-up in household formation may not be as robust as analysts would hope: “The data from electrical providers suggests slightly slower household creation last year, with 1.14 million new users, versus the Census figure of 1.3 million,” said the note. The upshot to both of these seems to be that the housing market will remain much as it has been: Slow, a little constrained by supply factors and household formations, but overall a decent positive for the economy. Not exactly unbridled optimism for a take-off in the housing market.